The three women are among 11 women on trial after being charged under the country's cyber-crimes law, which can carry a sentence of up to five years in jail. "They have been locked up, separated from their loved ones, subjected to torture and threats for simply peacefully calling for women's rights and expressing their views," she said. 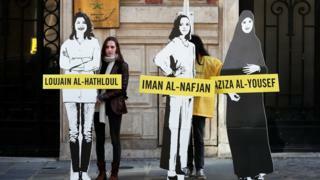 "Amnesty International calls on the Saudi authorities to drop all the charges against them and the other women's human rights defenders, who all must be released immediately and unconditionally." Four of the women have alleged they were tortured whilst in detention, while the brother of one jailed activist, Loujain al-Hathloul, recently told CNN his sister had described being regularly whipped, beaten, electrocuted and sexually abused in a basement she called the "palace of terror". Ms al-Hathloul's admission that she once applied for a job at the UN is being used as part of the kingdom's case against her, CNN reported. On Thursday the UN's special rapporteur on extrajudicial executions Agnes Callamard said that the kingdom's secretive hearings for 11 suspects accused in Mr Khashoggi's murder fell short of international standards, Reuters reported.